Two objects, A and B, have equal mass. Prior to the collision, mass A is moving 10 m/s in the +x-direction, and mass B is moving 4 m/s in the +x-direction. Which of the following results represents an inelastic collision between A and B? After the collision, mass A is at rest, and mass B moves 14 m/s in the +x-direction. After the collision, mass A moves 4 m/s in the –x-direction, and mass B moves 18 m/s in the +x-direction. After the collision, the two masses stick together and move 7 m/s in the +x-direction. 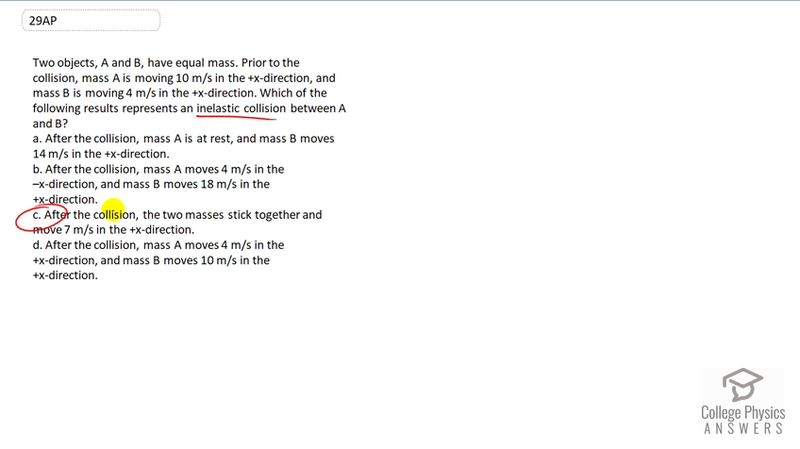 After the collision, mass A moves 4 m/s in the +x-direction, and mass B moves 10 m/s in the +x-direction. This is College Physics Answers with Shaun Dychko. When objects stick together, that collision is considered an inelastic collision. So the answer here is C and all we need to look at is just the fact that they stick together.